There are a number of places to pick up the required forms and get help filling them in. VAC district office staff will help prepare the application and tell you where to get supporting documents. Find the closest office online at www.veterans.gc.ca/eng/contact. Veterans Affairs Canada staff or Royal Canadian Legion representatives offer advice and support at Integrated Personnel Support Centres www.forces.gc.ca/en/caf-community-support-services-casualty-support/contact-info.page on bases and wings across the country. Legion command service officers will help you assemble information you need for your application and provide advice and support through the application and review process, free of charge. Contact a Royal Canadian Legion service officer through a local branch, e-mail servicebureau@legion.ca or phone 1-877-534-4666. An application for disability benefits can be made online after logging on or opening a My VAC Account. 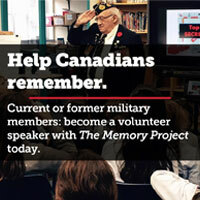 Register for an account online at www.veterans.gc.ca/eng/e_services/register. You can track the progress of your application through My VAC Account. If you would like to receive an application package by mail, contact Veterans Affairs Canada at 1-866-522-2122. The application forms can be downloaded at www.veterans.gc.ca/eng/services/disability-benefits/how-to-apply. Some military and RCMP veterans and their families who qualify for benefits from Veterans Affairs Canada are not receiving them, either because they haven’t applied or they have been rejected once and mistakenly believe that was a final decision. Veterans Affairs Canada has a suite of programs and benefits, including medical treatment and financial support, for veterans and serving members who have a chronic disability—any condition (including pain and mental health) that prevents or could prevent normal mental or physical activities and that was caused by or aggravated by service. To be eligible for benefits from Veterans Affairs Canada, you must have a chronic disability or health condition caused or aggravated by service in the Canadian Armed Forces or Royal Canadian Mounted Police; or wartime service in the merchant navy or some civilian military support roles or Allied forces. Spouses and children of veterans receiving VAC benefits, or who should have been receiving them, are also eligible for some benefits. There are common myths and misunderstandings that prevent those who have a service-related disability from applying, says Sherry Culling, a Royal Canadian Legion service officer in North Bay, Ont. Some people may think too much time has passed, but “there is no time limit on when you can apply for benefits,” said Cheryl Monahan of VAC’s adjudication office in Charlottetown. If you left the service at age 50, you can still apply for benefits in your 70s, 80s or 90s, so long as your disability is related to your service. Many people also do not connect a disability they have today with their service years earlier. Veterans can apply for benefits whenever their health condition changes; even if their service isn’t the sole cause of the disability, often it contributed to its severity. “I find a lot of seniors will say, particularly with hearing, that it’s just old age,” said Culling. They don’t connect constantly asking people to repeat themselves, misunderstanding what was said, or family complaints they turn the television up too loud, with working in a noisy service environment years earlier. Emotions can also be a barrier. Someone who’s intimidated by the application process, who’s angry or just fed up with all things military, may avoid applying. These people can benefit greatly from seeking expert help. “Having an advocate takes the burden off the shoulders of those applying,” says Culling. “They don’t have to worry about paperwork being incorrect or that they didn’t fill something in properly.” They also have someone to help them and provide advice and moral support if they decide to appeal the decision. Royal Canadian Legion command service officers will also represent them at a Veterans Review and Appeal Board hearing. Face-to face help and support is available from service officers at nearly 1,500 Legion branches and VAC disability benefits officers in district offices. Legion service officers and VAC counsellors can also be found at Integrated Personnel Support Units on bases and wings across the country. Others may have had a claim rejected once, and mistakenly think that’s final. Sometimes all that’s needed is tweaking of some words or supplying one more bit of evidence and the application can be resubmitted. Other times, the decision should be appealed. “I always say, ‘why wouldn’t you appeal? It’s not costing you anything but your time,’” says Culling. Those emotionally upset find the appeal process can be greatly smoothed by asking the help of experts like lawyers from the Bureau of Pensions Advocates and Legion service officers who have gone through the process many times before. Finally, spouses may be unaware they may qualify for benefits. If the veteran had been receiving or should have been receiving a Veterans Affairs Canada benefit, the spouse and survivors may continue receiving all or a portion of that benefit. If the veteran or serving member was applying for benefits at the time of death, the family can continue with the application. Spouses may put in new applications for benefits after the death of a veteran or serving member who should have been receiving disability benefits, even decades after the death of the veteran. Spouses and children of serving members may also qualify for death benefits from VAC in addition to those provided under the Canada Pension Plan and Canadian Forces Superannuation Act.